A survey has found that there is a strong demand for a Special Needs Trust (SNT) in Hong Kong to provide affordable financial planning services for individuals with intellectual disability, and for the Government to act as the trustee of such a trust. 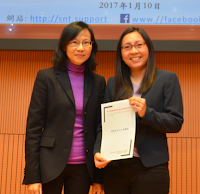 The survey, which targeted at parents of individuals with intellectual disability, was carried out in 2016 by Professor Lusina Ho and Associate Professor Rebecca Lee at the Faculty of Law of the University of Hong Kong (HKU) and the Concern Group of Guardianship System and Financial Affairs*. According to government statistics, between 71,000 and 101,000 people in Hong Kong are persons with intellectual disability. As existing mechanisms for the financial planning for these individuals are limited, many parents are concerned that after their passing, the care for their children with intellectual disability would be upset. Following the 2016 Policy Address of the Hong Kong Government, the Labour and Welfare Bureau is exploring the feasibility of setting up a trust to provide affordable financial services to these individuals. What is a Special Needs Trust (SNT)? An SNT is an affordable trust specially designed for people with special needs (including people with intellectual disability). An SNT can reduce the cost of administration by pooling funds contributed by parents for management and investment. However, like in an MPF, the amounts designated for each beneficiary will be segregated. To participate in such trusts, the parents (as settlors) with the help of the trustee and its case manager devise a care plan, which sets out the expenditures needed for the dependent-beneficiary, write a letter of intent that appoints a caregiver to succeed them and explains how the trust fund should be disbursed for the benefit of the dependent and after the dependent passes away, and then transfer a nominal sum to set up the trust. They also execute a will to transfer a substantial amount from their estate into the trust on their death, e.g. they may instruct the executor to sell their flat and put the proceeds into the trust fund. Of course, the parents may also transfer substantial assets into the trust during their lifetime. When the parents pass away, the trust will be activated. The trustee will then make periodic distribution to the succeeding caregiver according to the letter of intent and care plan. The trustee’s case manager can make periodic visits to the dependent to check that the caregiver is looking after the dependent. Upon the dependent’s passing, the trustee will distribute the surplus to any person(s) indicated in the letter of intent. The research is supported by RGC General Research Fund 2016-2017 (project number: 17612916). The survey report (in bilingual versions), press photos and presentation slides can be downloaded from www.snt.support. Or click this link to view the survey report. A video of the event launching the survey can be viewed here. For media enquiries, please contact: Ms Scarlette Cheung, Faculty of Law, HKU (Tel: 39172919; Email: scarlettecheung@hku.hk); or Ms Melanie Wan, Communications and Public Affairs Office, HKU (tel: 2859 2600; Email: melwkwan@hku.hk). * The Concern Group of Guardianship System and Financial Affairs is established by a group of parents and caregivers of persons with intellectual disability. Its mission is to strive for a better adult guardianship system through examining its current weaknesses and seeking for improvements of the policies and institutions pertaining to adult guardianship. It is hoped that these efforts will enhance personal care and financial management arrangements for individuals with intellectual disability in Hong Kong.